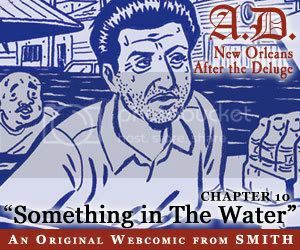 "A.D." Chapter 10: "Something In The Water"
Just posted on the spiffy redesigned SMITH site is A.D. Chapter 10: “Something In The Water.” In this episode, the Doctor administers first aid to Katrina survivors gathered at (of course) a Bourbon Street bar. Meanwhile, Hamid & Mansell wade through the chest-high flood waters to bring much needed drinking water to an elderly neighbor. Back in Tallahassee, Kevin and his brothers learn the extent and seriousness of the flooding. And Denise and her family arrive at the Convention Center. And of course the A.D. site features all the usual links, resources, audio clips, press clips, and message board chatter.